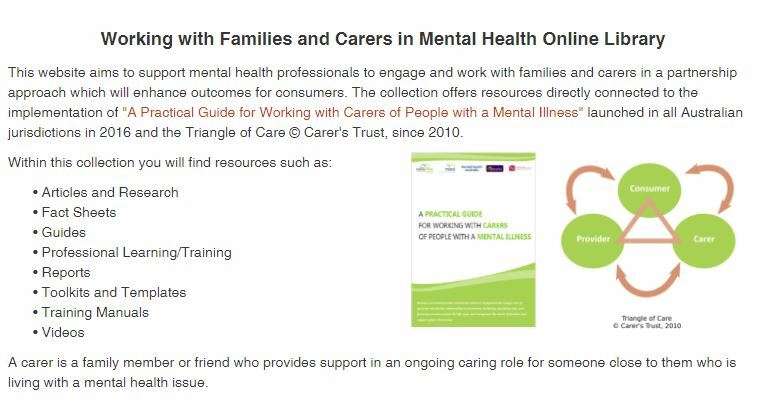 Find information for clinicians working with consumers with a diagnosis of Borderline Personality Disorder (BPD) and their carers, families and loved ones. Review articles and resources, research, useful websites and education and training options for clinicians. If you know of relevant articles or websites that would be useful for consumers, carers, families and/or clinicians, contact us or email admin@bpdsa.com.au and suggest what we can add to our website to make it more useful. We welcome your feedback and contributions. 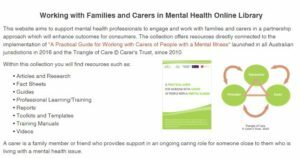 We are pleased to announce the launch of the Working with Families and Carers of People with a Mental Illness online library. The library contains fact sheets, articles, research, reports, tools, practical resources and online training to support health practitioners engage with families and carers. The information contained on this website is for general information purposes only. The information is provided by the PMHCCN (Australia) Ltd and while we endeavor to keep the information up to date and correct, we make no representations or warranties of any kind, express or implied, about the completeness, accuracy, reliability, suitability or availability with respect to the website or the information, products, services, or related graphics contained on the website for any purpose. PMHCCN (Australia) Ltd will not be held responsible for any loss, damage or injury caused by, or related to, the use of any information contained on this website at any time and provides no warranty of any kind. This website may contain links to other websites which are not under the control of the PMHCCN (Australia) Ltd. We have no control over the nature, content and availability of those sites. The inclusion of any links does not necessarily imply a recommendation or endorse the views expressed within them.